When it comes to gossip girl, it really is ‘all of the things’. The hit show is loved by girls on both sides of the Atlantic for its scheming, BFF back-stabbing and the all important face-palming OMG moments. One of the best things about the show, and I think most girls would agree, is the fashion. Each episode features multiple costume changes complete with perfect attention to detail with the accessories to suit each characters style profile. From Serena’s effortless Kate Moss-esque style to Blair’s stunning summer dresses, I always get severe wardrobe envy as I tune in! I recently watched Season 4, episode 8 and a particular piece worn by Ms van der Woodsen instantly stood out and I want one like it! Her skirt, a lovely Sari print number from design house Of Two Minds. I love the colours and the pattern and it looks great paired with the grey. After searching for where to buy this skirt, I found it on shopbob.com for $75. Sure, that’s pocket money for an upper east sider, but if im going to be stealing this style, it’ll be on a more recession-friendly budget! Once again, the fashion team at gossip girl are well ahead of the posse. There are only a few of this type of skirt on the high street at the moment, I’ve put together a few of the nicest I’ve found so far. 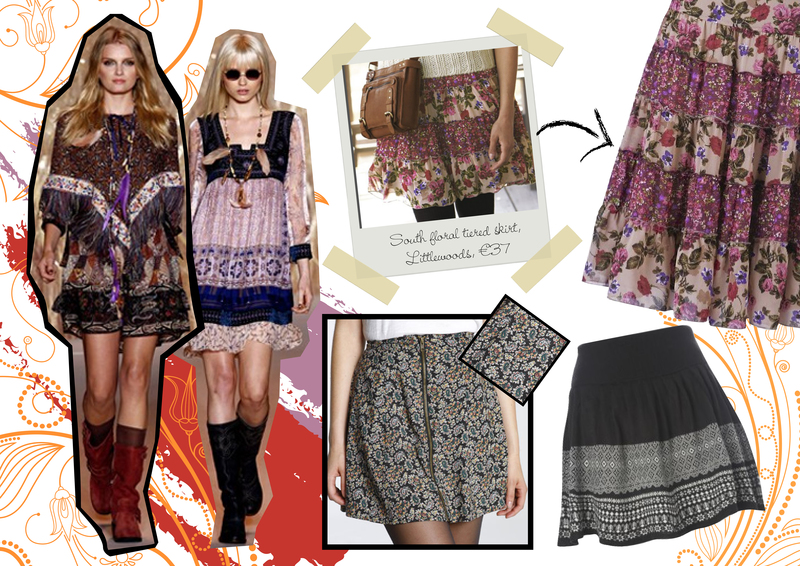 Among S/S 2011 trends is the revival of 1970’s boho chic. From these sari type patterns, rich colours and outstanding hair accessories. I’ll be sure to get one of these skirts, because judging from the catwalks of New York and London fashion week shows, prints are going to be huge next year! This entry was posted in Style Stalker and tagged anna sui, gossip girl, littlewoods, london fashion week, new look, new york fashion week, of two minds, printed skirts, s/s 2011, serena van der woodsen, urban outfitters. Bookmark the permalink.